Every month, we like to learn how teachers use Voki in the classroom. This month, we have another great interview with a tech-savvy educator! 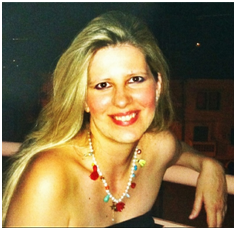 Christina Martidou is an English teacher who loves to use Voki to celebrate holidays! My name is Christina Martidou and I have been working as an English teacher for the past eleven years. I currently work freelance as a private tutor and part- time for the British Council in Thessaloniki, Greece. My students vary from young learners to teenagers. I mainly prepare learners for the Cambridge ESOL exams, develop my own technology-based materials and love writing on my new blog (http://christinamartidou.edublogs.org). I have been using Voki since 2011! What are your goals using Voki? To make my ELT lessons more fun and engaging! With Voki the use of technology becomes meaningful! How do you use Voki? I mainly use Voki with my younger students especially to celebrate holidays like Halloween and Christmas. I also love the idea of assigning homework via Voki or giving oral instructions in this alternative way. What are your 3 favorite things about Voki? The fact that you can record your own voice and add sound effects to it! Avatars can then be e-mailed or embedded in any social media site, blog or website. What would you add to the Voki product? I would extend the time limit of the recordings, add more celebrities among the speaking avatars and make it available for iPads & iPhones! Do you have any Voki tricks up your sleeve? I use Voki to play riddle games or a celebrity ‘guess who’ game! Christina made a PhotoPeach presentation. Click the picture below to see it! Want to be interviewed for the Voki blog? Send us an email at submit@voki.com and we’ll get in touch!